Conductor Eli Epstein will lead a classical music program Sunday at the Newton Free Library that focuses on encouraging audience members to use their imagination while listening to the music. 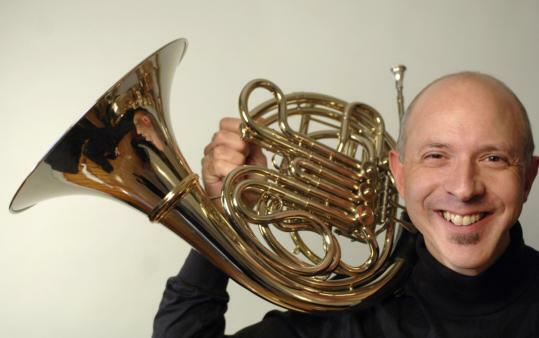 Conductor and French horn player Eli Epstein wants to give classical music performances a makeover. "I think the culture of classical music for a long time has been an elite one," he said. "I think it's been a distancing one that has turned off a lot of people." Aiming to transform the concert experience, Epstein pioneered "Inside Out," a presentation that he considers unlike anything most listeners have encountered. "In our surveys," he said, "62 percent of audiences said the concert changed the way they think about classical music, regardless of their previous exposure or knowledge." On Sunday at 2 p.m., Epstein will present his innovative program at the Newton Free Library in Newton Centre with four Boston Symphony Orchestra musicians, flutist Elizabeth Ostling, oboeist Laura Ahlbeck, clarinetist Tom Martin, and bassoonist Richard Ranti. The program features a wind quintet by Carl Nielsen and Samuel Barber's "Summer Music." "This concert is really different from a conventional concert," said Epstein, "because I talk to the audience and I really try to get them to look inside themselves at their own histories, at images and feelings that come up as they listen to the music." Epstein leads relaxation exercises, offers stories about the composers, and demonstrates several excerpts of the pieces before his ensemble performs them in their entirety. "I believe that how a person listens is just as important to a memorable musical experience as how the music is composed or performed," he said. "We found that, if we give people ways to listen to the music and use their imagination, they have a much deeper experience with the music itself." Epstein, 49, moved to the Boston area in 2004, after an 18-year stint with the Cleveland Orchestra. Now he freelances with a number of groups, including the Boston Symphony, the Philadelphia Orchestra and the St. Louis Symphony Orchestra. He also teaches and plays chamber music around town. "Inside Out" started in 2000, its concert flier advising people to "wear comfortable clothes and bring your imagination." In 2006, psychologist Cynthia Anne Hale became a collaborator. "When we write scripts of the program she really helps to keep things open," said Epstein. "We really want the audience to feel that there is no right or wrong in their interpretation of what they're hearing." The unique approach often moves people emotionally. Epstein described a performance of the Brahms Horn Trio, a piece written after the death of the composer's mother. Before playing the piece, Epstein said, he spoke about it as an expression of Brahms' grief. Some of the musicians were surprised at the effect. According to Epstein, "Afterward the pianist said to me, 'Do you realize that half the people in the audience were crying?' "
To Epstein, that kind of heartfelt reaction is perfectly appropriate. "Loss is a universal human experience," he said. "Everybody has it sooner or later. Brahms is giving us a great opportunity to look at our losses, re-grieve them, and in the end feel very understood. I think that's what art can do for people." Epstein's techniques, gleaned from the worlds of psychology and theater, work for the players as well as listeners. "That's sort of the other side of 'Inside Out,' " he said. "It's not just what I do with an audience, but when we rehearse pieces with the performers I try to get them to tap into their own feelings." Although Epstein advocates for expression in music, it's not at the expense of technique. In fact, Epstein believes that using the part of the brain associated with creativity can actually help the nuts and bolts kick in more easily. "When there's an artistic goal," he said, "an emotional image that is well defined, then the brain will make everything work toward that goal, and I think that includes the technical and the mechanical." Epstein said his interactive listening experiences offer social benefits, too. "What's really neat about 'Inside Out' concerts is they give people things to talk about afterward. It gives people ways to relate to each other over abstract music." "Inside Out" concert on Sunday, 2 p.m., at Newton Free Library's main branch, 330 Homer St. in Newton Centre. Free. 617-796-1360, newtonfreelibrary.net. EXPRESSIONS IN DANCE: At 23, Matt Parello has at least one thing in common with Ren McCormic, the lead character in "Footloose" - he loves to dance. According to Parello, who plays McCormic in the ongoing Steps Off Broadway production in Bellingham, the high-energy song and dance extravaganza is thematically multifaceted. "It's a little bit about family, a little bit about having fun, and I guess mostly about doing what you think is right," he said, with the redeeming power of movement at its heart. "The whole show is about dancing as a way to express yourself." Parello was in seventh grade when his family moved from Waltham to Shrewsbury. He said his upbringing allowed him to enjoy small-town life and the benefits of living near a city. "The theater companies in and around Worcester are amazing," he said, noting that he's worked with the Foothills Theatre Company, the Boston Dance Company, and Assumption College. After graduating from high school, Parello studied ballet and performance choreography at Long Island University, and he recently founded the Dance Company of Worcester. "I love being a dancer, but I have a passion for choreography," he said. Parello's company members are versed in ballet, break dancing, ballroom, hip-hop, and modern. Although Parello has plenty of stage experience, taking on a role as big as Ren McCormic can still be a challenge. "Most dancers don't have to speak, so memorizing all those lines and songs is hard," he said. Watching the 1984 Hollywood version starring Kevin Bacon in the role helped. "Even as a kid I used to watch that movie," he said. The hard work has its rewards. "It's fun being somebody that you're really not," said Parello. "I play a bad boy from the big city, so I get to have a little more attitude than I do in normal life." Once the 35-member, all-ages cast wraps up "Footloose" this weekend, Parello said, he plans to try his luck at some New York auditions. He also plans to schedule the first production by his dance company. In the meantime, he hopes to attract large audiences to the four Steps Off Broadway performances over the next three days. "It's a family show," he said, with the musical offering a good dose of comedy and a poignant love story, involving McCormic and the country girl he meets after leaving Chicago. And that's yet another way that Parello relates to his character. "I do consider myself a city kid," he said, "and my girlfriend . . . is a beautiful small-town girl." Steps Off Broadway performs "Footloose" tomorrow and Saturday at 7:30 p.m., and Saturday and Sunday at 2 p.m., at the John Lorusso Memorial Theater, 799 South Main St., Bellingham. $20, $18 seniors/students. 508-876-9797, steps-dancing.com. ARTISTIC EXPERIMENT: According to Randi Isaacson, owner of the Post Road Art Center in Marlborough, creative folks just need to gather on occasion. "Artists working alone sometimes need a push, some motivation, a sense of community to keep them creating," she said. To help supply that push, Isaacson said, she came up with a number of Saturday programs, including this weekend's second installment of Art Supply Experimentation Day. Isaacson recalled the time she picked up some state-of-the-art materials that really gave her work a boost. "They changed the whole course of my show that I was preparing for." For participants in Saturday's experimentation workshop, Jonathan Shulz will bring the latest in paints, brushes, papers, and other art supplies. Isaacson, who is requesting e-mailed RSVPs at randi@postroadartcenter.com so they know how many people to expect, said she is looking forward to the play date. "Trying out things and learning about new products and techniques just gets all the creative juices flowing. And it's free. How much more fun can we have?" Art Supply Experimentation Day, 10 a.m.-noon Saturday, Post Road Art Center, 1 Boston Post Road East, Marlborough. 508-485-2580, postroadartcenter.com.